The eligibility index is the combination of the high school grade point average and scores on either the ACT or the SAT. Grade point averages (GPA) are based on grades earned in courses taken during the final three years of high school. Included in calculation of GPA are grades earned in all college preparatory “a-g” subject requirements, and bonus points for approved honors courses. Up to eight semesters of honors courses taken in the last three years of high school, including up to two approved courses taken in the tenth grade can be accepted. Each unit of A in an honors course will receive a total of 5 points; B, 4 points; and C, 3 points. 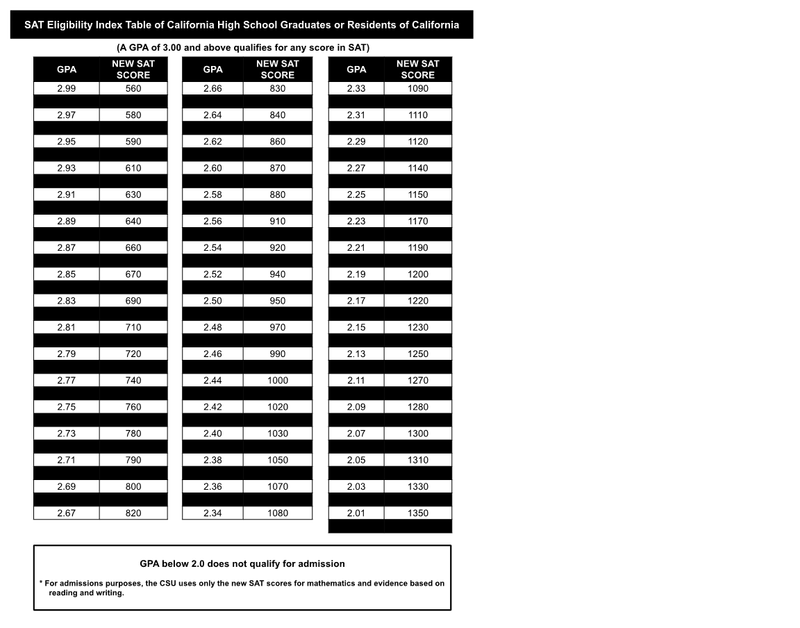 A CSU Eligibility Index (EI) can be calculated by multiplying a grade point average by 800 and adding your total score on the SAT exam (mathematics and critical reading on the old SAT, or mathematics and Evidence-Based Reading and Writing on the new SAT). For students who took the ACT, multiply the grade point average by 200 and add ten times the ACT composite score. 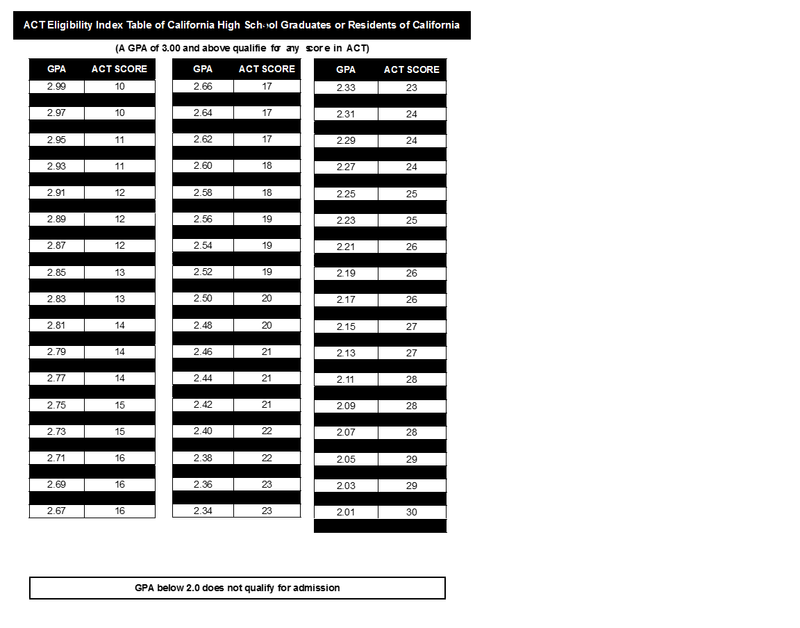 Persons who are California high school graduates (or residents of California for tuition purposes) need a minimum index of 2900 using the SAT or 694 using the ACT. 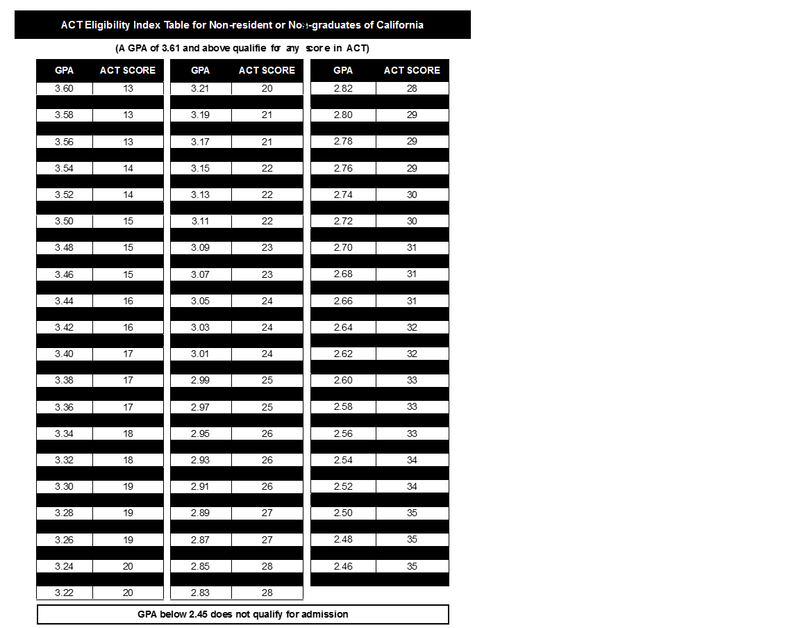 The Eligibility Index Table illustrates several combinations of required test scores and averages. The University has no current plans to include the writing scores from either of the admissions tests in the computation of the CSU Eligibility Index. Note: The minimum Eligibility Index requirement for admission to the Fall 2018 term will increase to 2950 using the SAT. 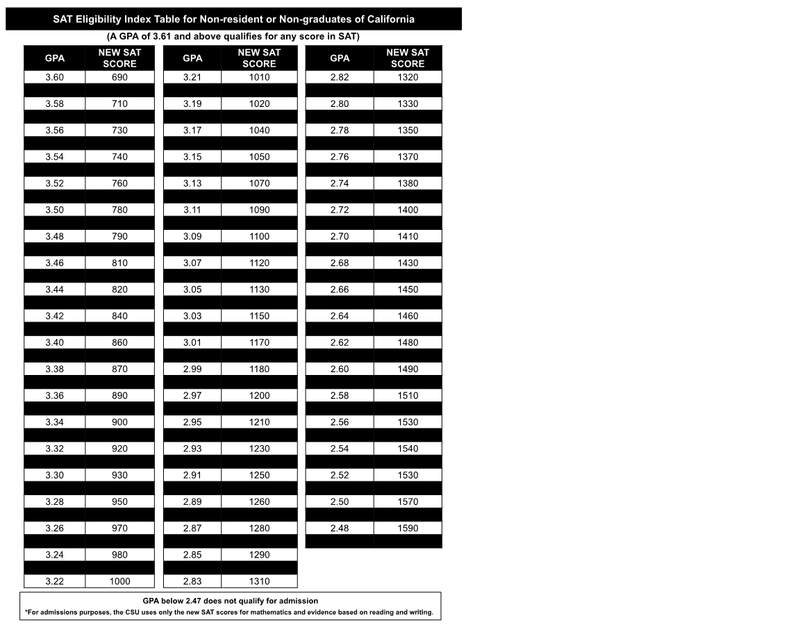 Persons who neither graduated from a California high school nor are a resident of California for tuition purposes, need a minimum index of 3502 (SAT) or 842 (ACT). Note: The minimum Eligibility Index requirement for admission to the Fall 2018 term will increase to 3570 using the SAT. Graduates of secondary schools in foreign countries must be judged to have academic preparation and abilities equivalent to applicants eligible under this section. An applicant with a grade point average of 3.00 or above (3.61 for nonresidents) is not required to submit test scores. However, all applicants for admission are urged to take the SAT or ACT and provide the scores of such tests to each CSU to which they seek admission. Campuses use these test results for advising and placement purposes and may require them for admission to impacted majors or programs. Impacted CSU campuses require SAT or ACT scores of all applicants for freshman admission.